Difference between revisions of "Execution Environments"
Execution environments tell the compiler and runtime the minimum level of class libraries required by your plug-in. Execution environments (EEs) are symbolic representations of JREs. For example, rather than talking about a specific JRE, with a specific name at a specific location on your disk, you can talk about the J2SE-1.4 execution environment. The system can then be configured to use a specific JRE to implement that execution environment. Execution environments are relevant both to development (compile) time and runtime. Our goal should always be to minimize our dependancies to make our plug-ins useful in more scenerios. If you set your EE to be J2SE-1.3, then the compiler will help you stick to that and not let you use APIs which exist in other class library versions. If you choose to increase your EE level, then you are forced to explicitly do so, rather than finding out later that you did it accidentally by referencing new APIs. Good bundles have minimal dependencies. This allows them to be used in a wider range of situations and results in a smaller overall footprint for applications built of these bundles. The execution environment needed by your bundle is key in both situations. Consider the different outcomes for some bundle A that requires just Foundation 1.0 and a bundle B that requires J2SE-1.5. First, A can be used in embedded devices where Foundation 1.0 is quite popular. Second, an application written entirely of bundles such as A can ship on a Foundation 1.0 JRE. This results in a 40-50MB disk/transfer footprint savings over J2SE-1.5 JREs! Not really. [[OSGi | OSGi]] allows bundles to be marked with the minimum execution environment they require (see the [[#Setting the Execution Environment | Setting the Execution Environment]]). Setting this value has two effects. # The compiler attempts to compile your bundle against the JRE associated with the EE you choose. For example, if you set your EE to be J2SE-1.3, then the compiler will help you stick to that and not let you use APIs which exist in other class library versions. If you choose to increase your EE level, then you are forced to explicitly do so, rather than finding out later that you did it accidentally by referencing new APIs. # The Equinox runtime will refuse to resolve/run your bundle if the current running JRE does not meet the minimum standard you specified. For example, if you attempt to install bundle B from above (requires J2SE-1.5) on a system running Foundation 1.0, B will not resolve or run. [[PDE/Resources/Execution Environments|This page describes]] how Execution Environments are defined within the PDE environment. Check out the table of execution environments in the [http://www.eclipse.org/eclipse/development/eclipse_project_plan_3_2.html#Appendix1 Eclipse 3.2 Plan]. The execution environment listed in the table is what your plug-in is committed to. If there is an error with the table, please send a note to the [mailto:eclipse-dev@eclipse.org eclipse-dev] mailing list and someone will update the table. As discussed above, you should seek to use the smallest EE possible. Practically speaking, when creating a new OSGi bundle J2SE-1.5 is a reasonable starting point. Given the pervasive use of generics in both the OSGi framework and other libraries, lower EE settings are only practical in very specialized applications. If your particular bundle requires capabilities from a later EE then specify a higher EE, but keep in mind this may limit adoption of your bundle for applications using an older Java runtime. Once a particular EE has been chosen, it should be left alone unless there is a clear advantage to moving up. Increasing your EE can create a lot of work with no real value, such as exposing your code to new warnings, deprecations, etc. Projects should not leave these choices to chance. Dependency structures are key parts of an architecture. For example, the [http://eclipse.org/eclipse Eclipse Project] has explicitly identified EEs for all of their bundles. These choices are documented in the [http://www.eclipse.org/projects/project-plan.php?projectid=eclipse#appendix project plan]. The execution environment listed in the table is based on the needs of the bundle and the expected use scenarios for the bundle. For example, all of the bundles key to RCP scenarios target only J2SE-1.5. No. You should seek to use the smallest BREE (Bundle Required Execution Environment) possible. There's several reasons to use a BREE smaller than your prerequisites. One is just sound architecture. Things might change in the future, so you want to code your bundle based on your needs. Maybe that prerequisite will be refactored out next release. Similarly, you do not (normally) have control over your prerequisites BREEs. They might lower theirs, they might raise it ... no reason to hard code some assumption in your bundle, based on your prerequisites. # Use build N20060420-0010 or later. 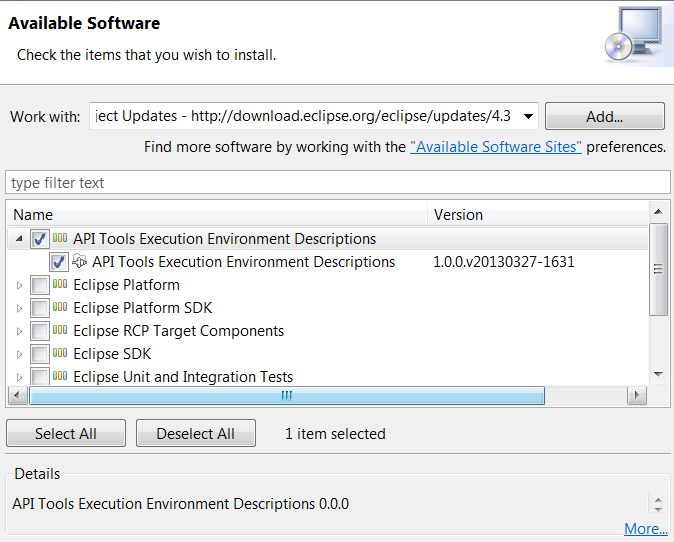 # Use Eclipse-SDK 3.2.x or later. # Right click on your plug-in's <tt>MANIFEST.MF</tt> and select '''Open With...''' -> '''Plug-in Manifest Editor'''. # Right click on your bundle's <tt>MANIFEST.MF</tt> and select '''Open With... > Plug-in Manifest Editor'''. # Select the '''Overview''' tab. # Note the section in the lower left corner entitled '''Execution Environments'''. # Add your appropriate environment(s). # Add your appropriate environment(s) noting the [[#Special cases|special cases]] below. # Select the link "update the classpath and compiler compliance settings". # Ensure you have no compile errors in your workspace. # Ensure you have no compiling errors in your workspace. <br /> Remember, for the BREE's to correctly effect compile errors in the workbench, you must have the proper <code>Execution Environments</code> defined under <code>Installed JREs</code> in your workbench preferences. It is quite normal to have 3 or more JREs installed such as for <code>J2SE-1.4</code>, <code>J2SE-1.5</code>, and <code>JavaSE-1.6</code>. # Release your changes to the repository. Bundles that require just Foundation 1.0 should in fact list Foundation 1.0 '''and''' J2SE-1.3 in their execution environments. This is because Foundation 1.0 is not a proper subset of 1.3 (it includes some additional javax.microedition classes). Listing them both in essence says that only the intersection of the two EEs is valid for use in the bundle. The situation is the same for Foundation 1.1 and J2SE-1.4. two is valid for use in that plug-in. The situation is the same for Foundation 1.1 and J2SE-1.4. In some cases, a bundle may optionally use function from newer execution environments if available but fall back to some other behaviour if not. Such bundles must be compiled against the maximum EE actually used in their code. For instance, the <tt>org.eclipse.osgi</tt> bundle uses <tt>java.nio. *</tt> classes from J2SE-1.4 if available. It can however run against the OSGI/Minimum-1.0 EE. As a result, it must be compiled against J2SE-1.4. In these cases you must list both the EE required for compilation and the absolute minimum EE for runtime in the '''Execution Environment''' section of the bundle '''Overview'''. The EE needed for compilation against must appear '''first''' in the list. So for <tt>org.eclipse.osgi</tt>, the list (in order) is ''J2SE-1.4'' then ''OSGI/Minimum-1.0''. You must distinguish between core parts of a JRE and optional parts. For example, the XML support is not a core part of the class libraries until J2SE-1.4. There are in fact many ways to get XML support added to almost any execution environment. While you can gain access to these classes by specifying the related EE, that overly restricts your bundles. The better approach is to ignore this type of class when choosing the minimum EE for your bundle and instead specify Import-Package clauses in the manifest.mf of your bundle. The IDE and runtime will then find other bundles that export the needed packages and wire the bundles together. This approach allows, for example, a bundle listing the J2SE-1.3 EE to use XML function as long as there is another bundle that provides (i.e., exports) the XML APIs. '''Running: ''' If you are running your application with a (for instance) Foundation VM and you have a bundle which provides the XML APIs, you need to set the following system propery: <tt>-Dosgi.framework.extensions=org.w3c.dom</tt> to make OSGi aware of the XML code. For the most part the Eclipse IDE manages the execution environments for you. You do however have to have the relevant JREs installed on your machine and configured into your IDE. Most JREs can be acquired from Oracle via their [http://www.oracle.com/us/java/‎ main web site] or their [http://www.oracle.com/technetwork/java/archive-139210.html handy archive site]. Note that the best source for suitable Foundation 1. * JREs is IBM's J9. See [[J9 | Getting J9]] for more details. When you install a new JRE, the IDE analyzes the function it provides and identifies the set of EEs it can support. The IDE distinguishes between '''exact matches''' for an EE and compatible matches. You can see all the execution environments and the JREs they match by looking at '''Window > Preferences > Java > Installed JREs > Execution Environments'''. If you do not have an exact match for an EE that is specified in one of your bundles but do have a compatible match, you get a warning. Continuing development runs the risk of using API which will not be present at runtime. If you have neither an exact or compatible match, your bundle's project will fail to compile. The set of execution environments is extensible but the Eclipse IDE includes support for the environments set out in the OSGi R4 specification. These are summarized in the table below. |OSGi Minimum Execution Environment 1.0 - This is a subset of the J2ME Foundation 1.0 class libraries defined by OSGi to be the base for framework implementations. |OSGi Minimum Execution Environment 1.1 - This is a subset of the J2ME Foundation class libraries defined by OSGi to be the base for framework implementations. |J2ME Foundation 1.0 - With the exception of some MicroEdition IO classes, Foundation 1.0 is a subset of J2SE 1.3. |J2ME Foundation 1.1 - With the exception of some MicroEdition IO classes, Foundation 1.1 is a subset of J2SE 1.4. [[J9 | Getting J9]] is the easiest way to get a Foundation JRE to run or compile against. When using the 4.3 Kepler update site the environments are contained in a single installable unit labelled "API Tools Execution Environment Descriptions" inside a category of the same name. Previous releases provided each execution environment description as a separate installable unit. In some cases, a plug-in may require a higher version to compile against, but is able to run perfectly fine against a lower version. For instance, the <tt>org.eclipse.osgi</tt> bundle will use <tt>java.nio. *</tt> classes if available. So it must be compiled against J2SE-1.4 but can run on OSGI/Minimum-1.0. In these cases the EE required to compile against must appear '''first''' in the list. So for <tt>org.eclipse.osgi</tt>, the list (in order) is ''J2SE-1.4'' then ''OSGI/Minimum-1.0''. Some bundles may think that they require an EE of J2SE-1.4 but really the only special thing that they require from the 1.4 class libraries are the JAXP XML APIs. So in these cases they can be listed as having an EE of J2SE-1.3 because they still will run ok if another bundle is providing the XML APIs. 1 What are Execution Environments? 2 So what does this mean to me and my bundles? 3 Wow! Is this hard to setup? 4 Which Execution Environment should I use? 5 I have prerequisites that require version X to run, so shouldn't I require version X too? So what does this mean to me and my bundles? Wow! Is this hard to setup? Not really. OSGi allows bundles to be marked with the minimum execution environment they require (see the Setting the Execution Environment). Setting this value has two effects. The compiler attempts to compile your bundle against the JRE associated with the EE you choose. For example, if you set your EE to be J2SE-1.3, then the compiler will help you stick to that and not let you use APIs which exist in other class library versions. If you choose to increase your EE level, then you are forced to explicitly do so, rather than finding out later that you did it accidentally by referencing new APIs. The Equinox runtime will refuse to resolve/run your bundle if the current running JRE does not meet the minimum standard you specified. For example, if you attempt to install bundle B from above (requires J2SE-1.5) on a system running Foundation 1.0, B will not resolve or run. This page describes how Execution Environments are defined within the PDE environment. Which Execution Environment should I use? Projects should not leave these choices to chance. Dependency structures are key parts of an architecture. For example, the Eclipse Project has explicitly identified EEs for all of their bundles. These choices are documented in the project plan. The execution environment listed in the table is based on the needs of the bundle and the expected use scenarios for the bundle. For example, all of the bundles key to RCP scenarios target only J2SE-1.5. I have prerequisites that require version X to run, so shouldn't I require version X too? Use Eclipse-SDK 3.2.x or later. Right click on your bundle's MANIFEST.MF and select Open With... > Plug-in Manifest Editor. Note the section in the lower left corner entitled Execution Environments. Add your appropriate environment(s) noting the special cases below. Select the link "update the classpath and compiler compliance settings". Ensure you have no compiling errors in your workspace. Remember, for the BREE's to correctly effect compile errors in the workbench, you must have the proper Execution Environments defined under Installed JREs in your workbench preferences. It is quite normal to have 3 or more JREs installed such as for J2SE-1.4, J2SE-1.5, and JavaSE-1.6. Release your changes to the repository. Bundles that require just Foundation 1.0 should in fact list Foundation 1.0 and J2SE-1.3 in their execution environments. This is because Foundation 1.0 is not a proper subset of 1.3 (it includes some additional javax.microedition classes). Listing them both in essence says that only the intersection of the two EEs is valid for use in the bundle. The situation is the same for Foundation 1.1 and J2SE-1.4. In some cases, a bundle may optionally use function from newer execution environments if available but fall back to some other behaviour if not. Such bundles must be compiled against the maximum EE actually used in their code. For instance, the org.eclipse.osgi bundle uses java.nio. * classes from J2SE-1.4 if available. It can however run against the OSGI/Minimum-1.0 EE. As a result, it must be compiled against J2SE-1.4. In these cases you must list both the EE required for compilation and the absolute minimum EE for runtime in the Execution Environment section of the bundle Overview. The EE needed for compilation against must appear first in the list. So for org.eclipse.osgi, the list (in order) is J2SE-1.4 then OSGI/Minimum-1.0. Compiling: If you have your EE set to be one (like Foundation 1.0) which doesn't provide the XML APIs, then in order to compile and run you need to retrieve a bundle that provides these APIs such as org.w3c.dom from Orbit. Running: If you are running your application with a (for instance) Foundation VM and you have a bundle which provides the XML APIs, you need to set the following system propery: -Dosgi.framework.extensions=org.w3c.dom to make OSGi aware of the XML code. Most JREs can be acquired from Oracle via their main web site or their handy archive site. Note that the best source for suitable Foundation 1. * JREs is IBM's J9. See Getting J9 for more details. When you install a new JRE, the IDE analyzes the function it provides and identifies the set of EEs it can support. The IDE distinguishes between exact matches for an EE and compatible matches. You can see all the execution environments and the JREs they match by looking at Window > Preferences > Java > Installed JREs > Execution Environments.